The Britain at War magazine's book of the month for April 2016. You'll be £19.99 closer to your next £10.00 credit when you purchase Tobruk Commando. What's this? "Gentlemen, we are going to capture Tobruk and destroy it." 'Operation Agreement' started as a fairly simple plan to destroy Rommel's bomb-proof oil-storage tanks at Tobruk on the eve of Alamein. But, catching the imagination of GHQ, the plan snowballed alarmingly. As well as a commando unit led by the plan's originator, Colonel Haselden, it came to include the RAF, the Royal Navy, the Marines and two of the largest destroyers in the Mediterranean. It was a daring attempt to rob Rommel at one stroke of the three essentials to success in North Africa - oil, a supply port and shipping. But the calculated risks began to out balance the chances of success when it seemed that every dockyard worker in Alexandria and every cocktail-party-goer in Cairo knew about the raid before the officers and men set out. The operation went on, and became a tragedy of slaughtered men and sunken ships. Tobruk Commando is a classic adventure story of the Second World War. The fast-moving action centres on the small commando of men which set out secretly through the deserts towards Tobruk. After a long journey across the desert sand, they arrived disguised as a group of POWs and their German captors. Expertly written, this is a wonderful tale of heroic bluff and a venture to test the courage and nerves of the toughest men. Operation Agreement started out as a relatively simple but daring plan to destroy Rommel’s bombproof oil storage tanks at Tobruk, thus depriving the Germans of three essentials to success in North Africa, namely oil, a supply port and shipping. However, catching the imagination of GHQ the plan snowballed. As well as a commando unit led by Colonel Haselden, the operation’s originator, it came to include comprised a series of ground and amphibious operations carried out by British, Rhodesian and New Zealand forces, the RAF, the Royal Navy, the Royal Marines and two of the largest destroyers in the Mediterranean. News of the raid spread and it seemed that everyone in Cairo knew about the mission before it had even begun. Nevertheless, the operation went ahead in September 1942, but attacking without air cover, it was a disaster. The raiders lost several hundred men killed and captured, three warships, seven motor torpedo boats and dozens of small amphibious craft. The author centres his story on the small commando force which set out through the desert towards Tobruk. After a long journey they reached their destination disguised as a group of prisoners of war with their German captors. First published in 1989 and now in 2015, this really is a stirring tale of heroic bluff. There are 29 monochrome illustrations included, as well as a map showing the route the commandos took. 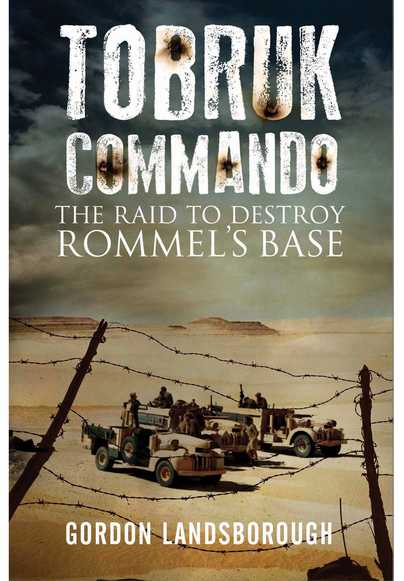 First published in 1989, this is a welcome republishing of the classic account which reveals the true story of one of the most audacious British military operations of the Second World War - the mission to destroy Rommel's base in Tobruk. The objective was to undermine the Axis war effort in North Africa by destroying airfields, harbour facilities, ships, vehicles and large oil stores. Though the mission was a failure, it is still a tale of the heroism of all those involved and a fitting testament to them. Landsborough’s book presents the account of Operation Agreement which was an audacious plan to attack and destroy the German base at Tobruk during late 1942. Due to a catalogue of errors and misadventure, not helped by the fact that security was lax and the enemy was aware of the Operation almost from its inception, all the Allied personnel involved showed determination, courage and considerable heroism in pursuance of achieving objectives against the odds. From the first page the author shows skill at setting the scene, introducing the ‘characters’ and laying out the story in an absorbing and engaging manner. This is classic story telling that embraces the reader and ‘brings to life’ the account in fascinating and vivid detail. Tobruk Commando is not just another book about war. It is a very well presented, well researched and highly informative and gripping story. ... atmosphere dripping from every page. Even the most ordinary scenes are brought vividly to life. The book is of its time; a vivid adventure story of British grit and daring do with no counter view from the German or Italian side... It is a great read. Gordon Holmes Landsborough, (1913–1983), English publisher, author and bookseller, was in the forefront of change in the paperback publishing in England during the 1950s to 1980s. He was noted for his prolific output as an author and his books include Long Run to Tobruk and Benghazi Breakout.